Author Mosher, Thomas Bird, 1852-1923. Title I shall never again read books. Published San Anselmo, Calif. : Private press of E. Woodward, 1981. Description broadside : ill. ; 9 x 22 cm. Series Keepsakes for the RBMS Preconference at San Francisco. Note Printed in mauve and black on cream-colored paper. At right of text cut of an open book in mauve. Colophon in lower margin: Printed at the Private Press of Emily Woodward. San Anselmo. 1981. Issued with others in lettered illustrated envelope, inscribed: Keepsakes for the RBMS Preconference at San Francisco. June 23-26, 1981. From the Small Press Club of Marin. LC subject Books and reading. Other info Broadsides California 1981. United States California San Anselmo. Other author Woodward, Emily, Printer. Of course I contacted the Hay Library at Brown University hoping that they might be willing to part with one of their two copies. Generally speaking this isn’t a particularly bright move since academic libraries don’t customarily part with their material in such a way, but I thought it was worth a try. As expected, no response was forthcoming. Greetings from a fellow ABAA book dealer. I’m wondering if you know how I could get in contact with Emily Woodward who has a private press there in San Anselmo. In particular I found out that she printed a keepsake for the RBMS Preconference in San Francisco, a single sided broadside entitled “I shall never again read books” in 1981. This is a quote from Thomas Bird Mosher, the publisher I collect. I’d dearly love to get a copy of this keepsake and wonder if you know of her and how I might contact her. Of course, should you wish to middle man the broadside rather than give out her contact information, I’d be glad to purchase it from you. Alas, Michael Good delivered the bad news. Emily Woodward “died of cancer a number of years ago at a much too young age” and he never saw the small broadside about which I was inquiring. He mentioned contacting some of the booksellers who have attended RBMS regularly over the years, but alas, none of them remembered this piece of ephemera. That’s part of the problem with ephemera. It’s fleeting, of importance for the moment and then dismissed, thrown into a drawer, or thrown away. Thousands could be printed but few survive, and resale value, if it has any value at all, is mostly negligible –although I wouldn’t mind having some cast off pages from the Gutenberg Bible. With the above in mind, I next I turned to putting a notice on ExLibris, the official “chat” line for libraries around the world. Back in June 24-28, 2004 I was trying to get hold of the private printer, Emily Woodward of San Anselmo, but have found out that she died of cancer a number of years ago. In particular, I found out that she printed a keepsake for the RBMS Pre-conference in San Francisco, a single sided broadside (9 x 22 cm.) entitled “I shall never again read books” in 1981. This is a quote from Thomas Bird Mosher. Does anybody on Exlibris have an extra copy or two of this lying around that you’d be willing to part with, or know where I could get one? Nobody from the ExLibris membership responded and there the matter seemed to drop until I was startled by an Oak Knoll Book listing on the Internet which just had to contain the item. 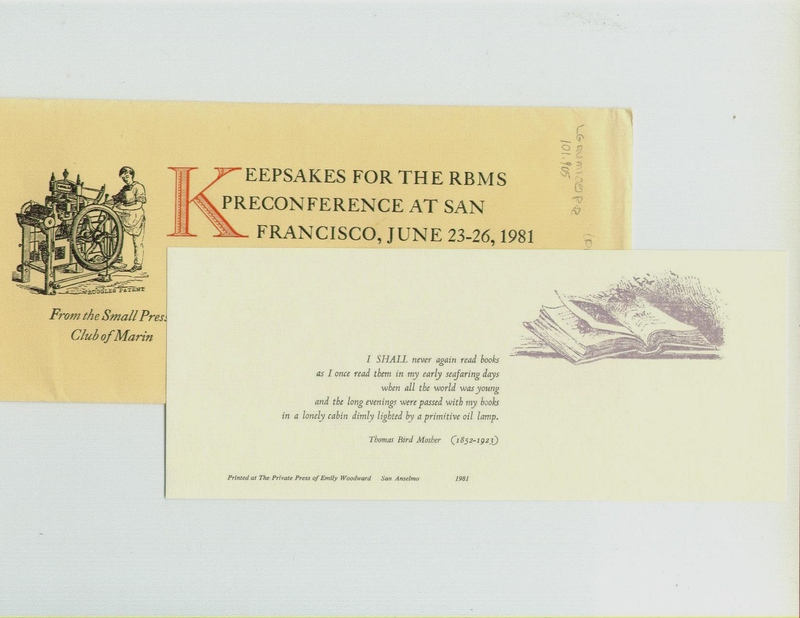 KEEPSAKES FOR THE RBMS* PRECONFERENCE AT SAN FRANCISCO, JUNE 23-26, 1981, n.p. 1981 paperback. The envelope has the title, a black-and-white picture of a printing press, and “From the Small Press Club of Marin” on it. Contains seven inserts with various quotes and pictures on them printed on various kinds of paper by various private presses. Insert 1: Quote by Thomas Bird Mosher, “Printed at The Private Press of Emily Woodward” of San Anselmo, 1981. Insert 2: Quote by Ruth Krauss, Figment Press, Mill Valley, CA. Insert 3: Quote by Thomas Carlyle, “Printed by Jeff Craemer, Greenbrae Press”. Insert 4: Quote by Thomas Carlyle, “Printed by Carol Cunningham, Sunflower Press”, Mill Valley, CA. Insert 5: Quote, “The Clamshell Press”, 1981. Insert 6: Quote by Bacon, “A. B. Peters, Sunshine Press”, 1981. Insert 7: Quote by Richard Jago, “Feathered Serpent Press: Susan Acker, 1981”. Minor wear and creasing at right edge of envelope. On May 8th immediately after seeing this listing I called Oak Knoll and asked Rob Fleck to find the particular broadside so that I could be sure before ordering. He read the short quote: “I shall never again read books / as I once read them in my early seafaring days / when all the world was young / and the long evenings were passed with my books / in a lonely cabin dimly lit by a primitive oil lamp.” That was it! Send it. No! I shall never again read books as I once read them in my early seafaring when all the world and love were young! Nor shall I ever forget those days of tropic splendour, or nights when only a faint and oily lamp swung in the lonely cabin; the plunging ship midst ocean’s grey and solitary waste, and the long wintry passage around Cape Horn. Hence these shadow-shapes of the buried life are very real and vital to me. If there is undue egoism in such intimacies, I feel I may take the risk, confident that others have fared along the self-same road and will recognize footprints of their fellow traveler. Yet this still doesn’t account for the passage as printed by Woodward. She used the phrase …”in my early seafaring days…” The word “days” doesn’t appear in the 1912 Amphora, (and in all subsequent editions up to the 5th and last of 1926). Perhaps Woodward just borrowed from the phrase “when the days” and plugged in “days” after the word “seafaring” or perhaps it’s an indication that she had another source. Perhaps someone reprinted Mosher’s words with some revision of their own. Furthermore, the arrangement of the text in her small keepsake broadside breaks the wording up into five distinct lines. Did she find such an arrangement in another source? Or was that arrangement just a printer’s way of newly presenting the text? We perhaps will never know since we can no longer ask the printer and all the appearances of which I‘m aware have been covered, but one thing it has taught me is that even in “reprinting” Mosher’s introductions from his catalogues, one should not assume that the texts weren’t revised for representation in the Amphora. This then, beyond having the keepsake for the Mosher collection, is yet another reason why I’m thankful to have found a copy.